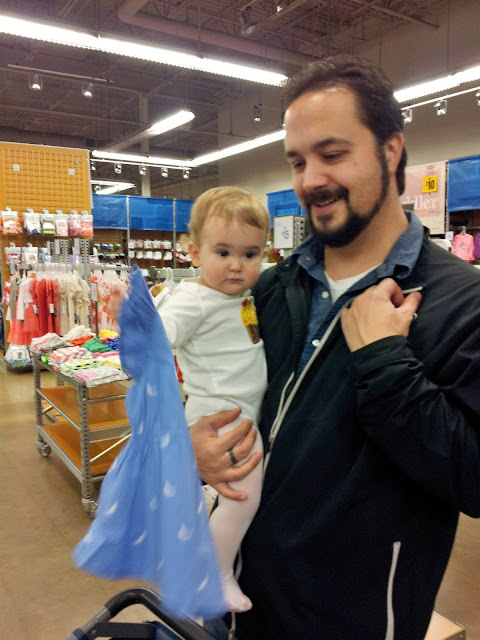 Frugal Foodie Mama: Get On Over to the Old Navy Kids & Baby Sale! Get On Over to the Old Navy Kids & Baby Sale! There is no better time to pick up some new Old Navy garb than during their Kids & Baby Sale going on right now. Prices have been reduced by up to 40%! Not to mention, their clearance section has been slashed too. Oh yes... I love those little orange stickers! Yep. We got it all for about $75! 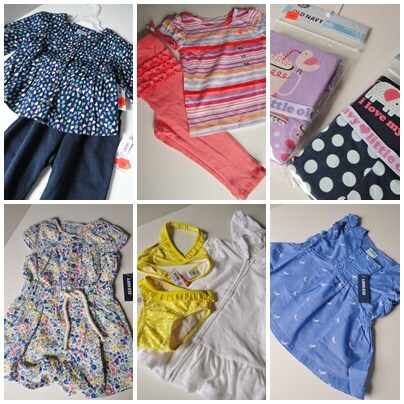 Two shirt & pants sets & two sets of pajamas for right now. And a romper, bikini, a hooded zip up terry cloth cover up, and a sweet little top all for later on this coming spring & summer! We had a wonderful shopping experience at our local Old Navy. The manager was so helpful. I had been hoping to buy a couple of pairs of jeans for my teenage son, but the largest size in the boys' jeans that they carried in store were 16's. The manager went above and beyond to measure the inseam of the size 16's for us. But we needed the size 18's, which are only available online. I would have loved to have showed you all how I dressed my 1 year old & my 14 year old from the Old Navy Kids & Baby sale in the store. Speaking of cuteness, how adorable is this outfit?? Both pieces? Just $10 total! What you can't see is the adorable ruffles on her bum, but you can catch them in my Old Navy wardrobe photo collage above.